This site contains commentary on historical and diverse regional issues, written by intersex people with first-hand experience, as well as documenting actions taken by intersex-led organizations to mark Intersex Days. Adopt or recognise statements by intersex-led organisations, like the global 2013 Malta Declaration, the 2017 Australian – Aotearoa/NZ Darlington Statement, or the 2017 Vienna Declaration in Europe. Make sure your actions and words conform to these statements. Recognise the specific issues and experiences of intersex people, and our core demands for recognition of our rights to bodily integrity and truth. Don’t redefine intersex or use the existence of intersex people to pursue other objectives. If you claim to be “LGBTI” inclusive, make sure you are, beyond your use of the acronym. Help intersex-led organisations in their work. Fund their work. Share our words. Put first-person intersex voices front and centre of all work on intersex issues. Find your local intersex-led organizations. Screen a movie like Intersexion or Orchids: My Intersex Adventure. Short movies like XXXY are also available online. Publish your story, in a poem or essay, or in the media. Hold a public forum or Q&A session with your local intersex-led organization. Ask your government to take action. Ask your local health, medical and human rights institutions to take action to end harmful practices, stigma and discrimination. Hold a rally outside your parliament, hospital or medical school. Go talk with your parliament, government, hospital or medical school. They might start to do stuff. Raise funds for your local intersex-led organization. Talk about intersex, Share resources, stories, videos and memes on Twitter, Facebook, Tumblr and other social media. Try and focus on material produced from an intersex perspective. We’ll share many of these on the Intersex Day Facebook page and Twitter feed. 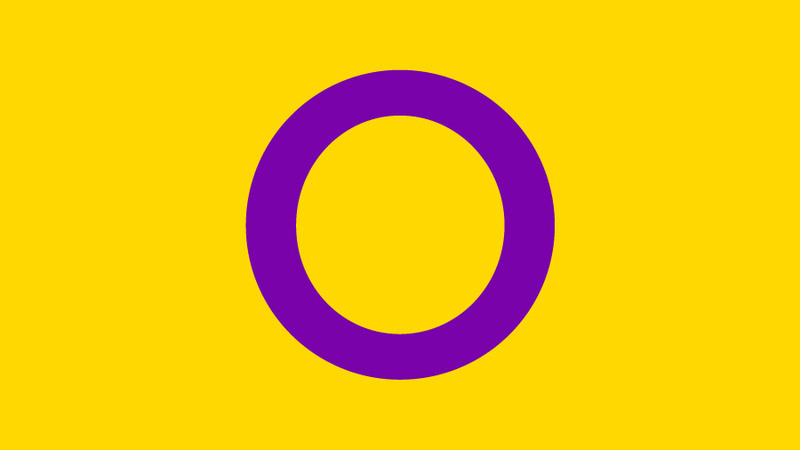 Intersex flag. Download in PDF, JPG, or SVG formats. Flag makers can print a 900mm by 600mm flag using this PDF file: flag.pdf. This scalable vector version of the intersex flag can be resized by a designer: flag.svg. Find out more about some of the symbols used to represent intersex people. Your local intersex-led organizations may have materials that can be downloaded and distributed. What can you do after Intersex Awareness Day is over? There is still time for action before Intersex Day of Solidarity on 8 November! There is still time to act after the two Intersex Days. Share the UN Fact Sheet on Intersex, and international statements by intersex-led organisations with your local human rights and health bodies. Share the website United Nations for Intersex Awareness. Follow intersex-led organizations on social media and share their posts. A listing of intersex-led organizations.